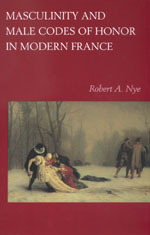 In this study of upper-class masculinity from the end of the ancien régime in 1789 to the end of World War I, Robert Nye argues that manhood, masculinity, and male sexuality is, like femininity, a cultural construct, comprising a strict set of heroic ideals and codes of honor which few men have been able to realize in practice. In doing so, Nye destabilizes and historicizes the male body, and incorporates gender into the brand of cultural history inaugurated by Norbert Elias in the 1930s. Robert A. Nye is Horning Professor of the Humanities and Professor of History at Oregon State University. He is the author of Crime, Madness, and Politics in Modern France (1984).